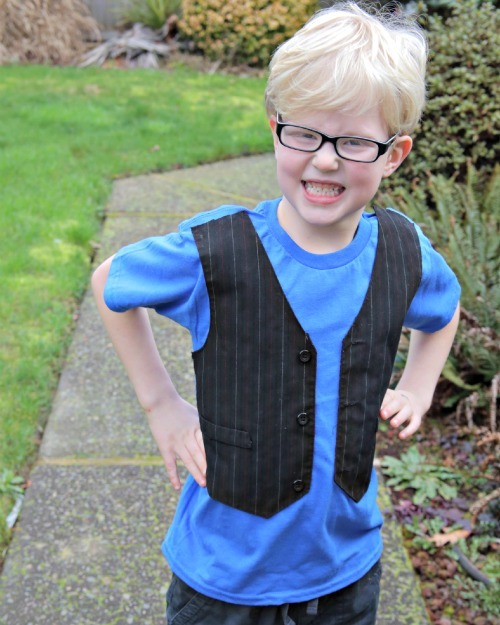 iLoveToCreate Blog: No-Sew Vest T-shirt: New Life for Old Clothes! 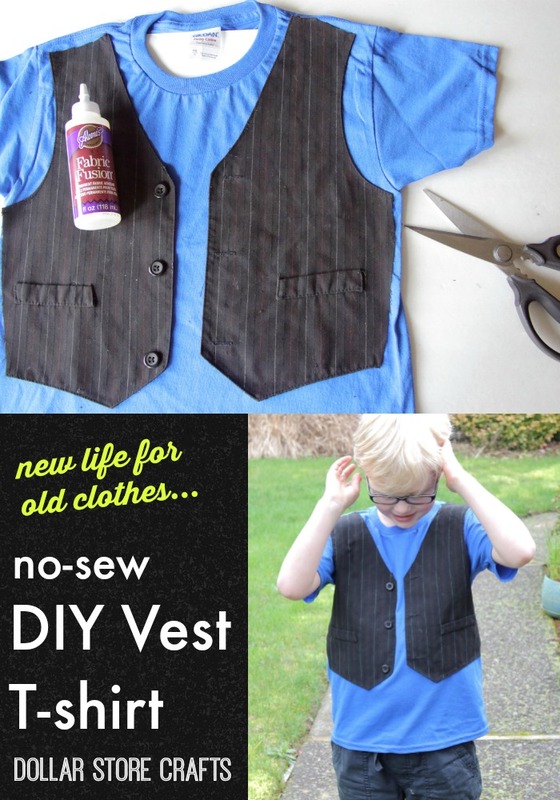 No-Sew Vest T-shirt: New Life for Old Clothes! 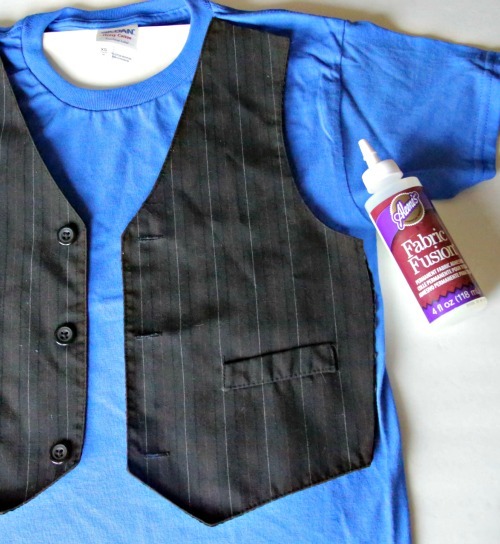 As the mom of four boys, I know how quickly kids can stain, rip, or otherwise destroy their clothes. 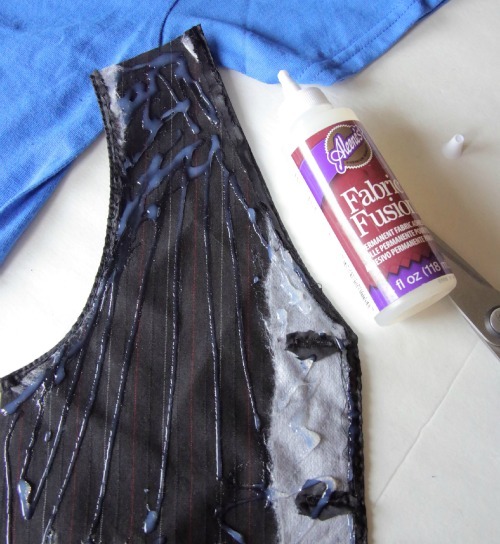 But just because it's stained or holey doesn't mean you can't remake a clothing item into a great new piece! Combine two or more old pieces to help build a brand new t-shirt. You don't even have to know how to sew. 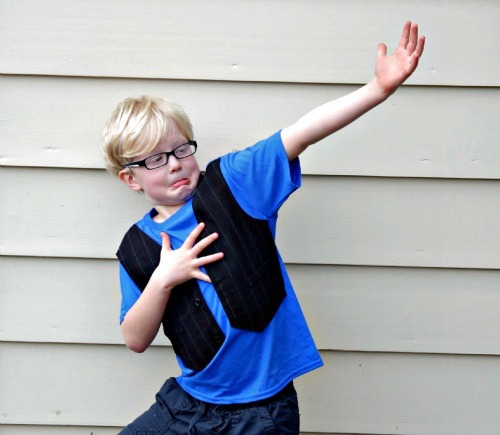 I took a too-small vest and combined it with a colorful t-shirt to make a new wardrobe staple that I love. 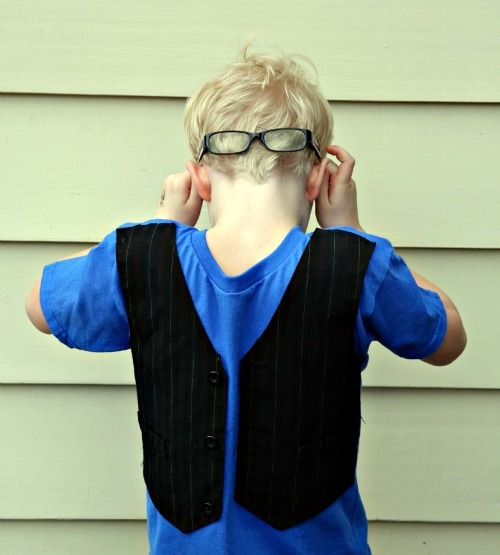 Just how easy is it to make this stylin' DIY vest t-shirt? 1. Gather your supplies. You can use an old t-shirt with a rip or stain (just cover the damaged part with the vest), or use a new t-shirt from the dollar store, like I did. 2. Cut the front of the vest off of the back of the vest. 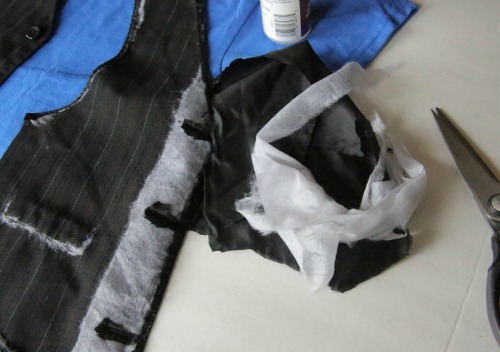 Keep the front seams intact on the vest, and just cut around the lining on the back. You might need to cut around parts like buttons or button holes. It's okay if you leave a little of the lining or interfacing. 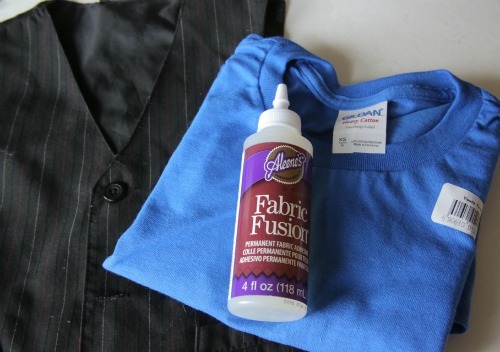 The point is to remove the extra fabric on the wrong side of the vest so you can be sure that the vest fabric is well-fused to the t-shirt with the Aleene's Fabric Fusion. 4. Line the inside of the t-shirt with scrap paper to keep the Fabric Fusion from bleeding through and fusing the inside of the shirt together! 5. 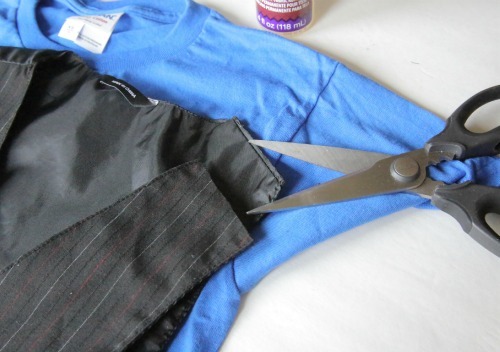 Lay the t-shirt flat on your work surface, then lay the vest pieces over the t-shirt to determine the placement. 6. Put a good amount of Aleene's Fabric Fusion glue on the back of each vest piece, paying special attention to the edges, then glue vest piece to t-shirt. 7. Allow glue to dry according to package instructions (about 2-4 hours). When glue is dry, remove the paper insert. You can use this technique to combine any items of clothing into new and unique pieces. Look through your closet to find old clothing that needs new life: stained, ripped or too-small items that are similar in color or style, or radically different. This is such a fun way to play with fashion design. We saved this old vest (that was too small to wear) and made it into a new cool shirt that reminds me of something from Bill and Ted's Excellent Adventure. Tip: You can also combine your favorite fabrics with clothing to make unique items like this No-Sew Owl Applique T-shirt. For more dollar store craft ideas, visit me at Dollar Store Crafts. This is fabulous!! Love that it's no sew! Great idea!!!! 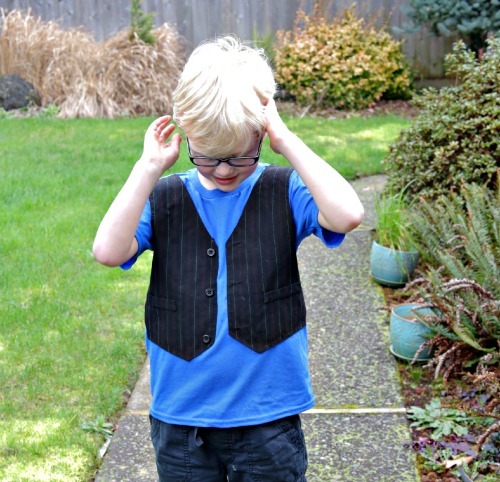 My son recently grew out of a vest he loves. I am so doing this! This is awesome! I'll have to do this for my youngest ~ he would love it! Thank you so much for good idea. My son will love it with vest.